You may have noticed that I've been posting more on crocheting lately. In fact, I have another crochet post scheduled to be up later this week! So I hope you enjoy reading or at least looking at my crochet work. 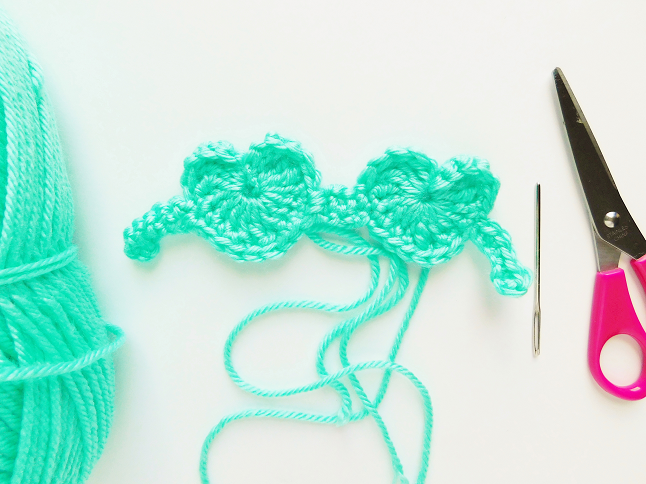 I've been crocheting a lot lately so I decided to squeeze in a simple pattern that you can whip up in minutes! 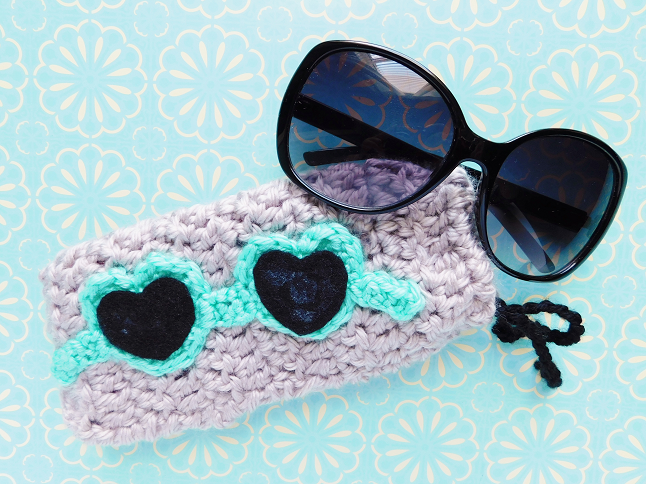 Since it's still summer I made a project perfect for summer, a sunglasses sleeve/cozy/pouch! 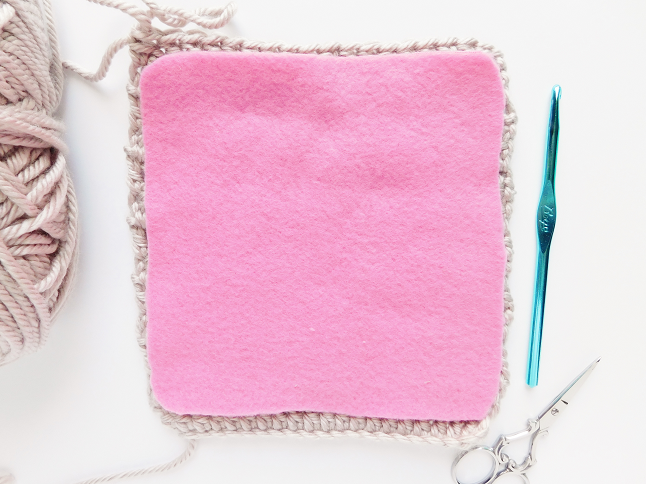 The pouch itself is really easy to make but the rest may be a bit complicated to understand. If you have any trouble leave a comment and I will try to explain as best as I can. If you are wondering why the black part of the glasses looks so messy it's because I had a glue accident. Make sure you use a strong glue and be careful when you are gluing everything down! 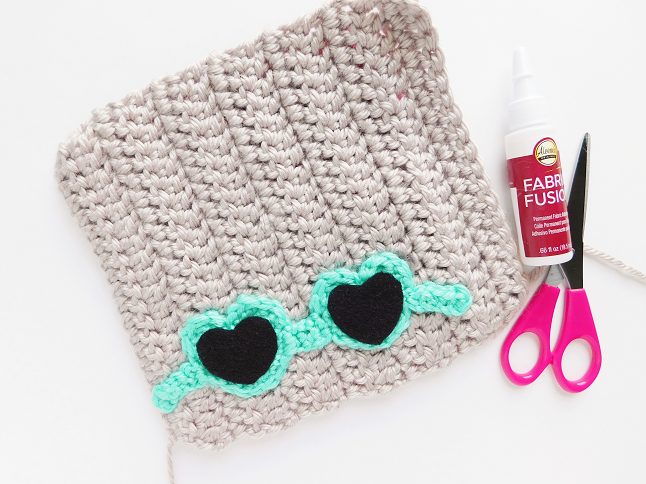 Use the larger crochet hook and bulky yarn. With smaller hook and worsted yarn create a magic circle, slst, ch 3. In the center of the circle crochet 3 tr. Next 4 dc, ch 1, 1 tr, ch 1, 4 dc, 3 tr, ch3. Slst in the center of the magic circle. Sc around the heart to make it larger. Cut off leave long tails for sewing. Now make another one. 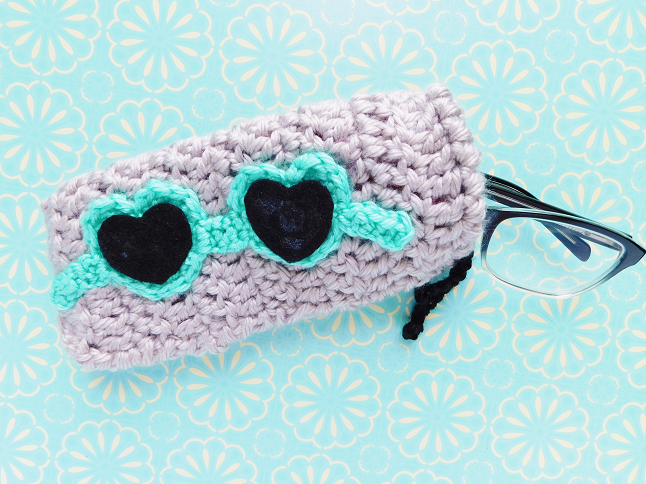 To make the 'ears' of the glasses insert your hook to the 6 st of the right side of one of the hearts. Slst, ch 6. Make 2 sc starting with the 2nd ch from your hook, slst, sc 4, cut off. Repeat on the other heart but on the opposite sides. Insert your hook on the left side of one of the hearts on the 5 st. Slst, sc 2, turn, ch 1, sc 2, cut off. Using the strand of yarn attach this piece to the opposite side of your other heart piece. Using the long yarn tails sew the sunglasses piece on to one of the sides of the sleeve. 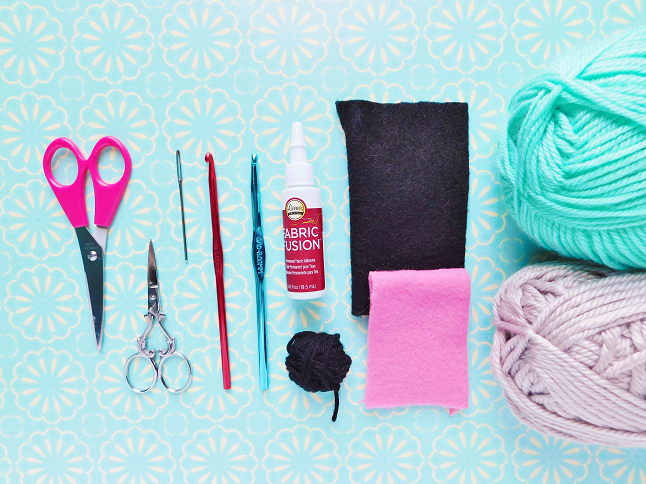 You will be holding and sewing the pouch later so make sure you line up everything perfectly. 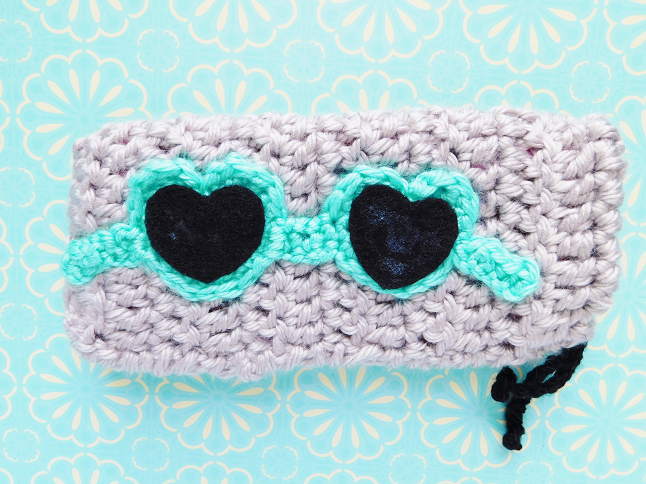 Once you have sewn the sunglasses on cut out to black heart shapes out of the heart and glue on top of the hearts. Next cut out a large piece of felt (I used a softer felt, like fleece) enough to almost cover the crochet square but make sure to leave some space to sew the pouch together later. Now glue the felt piece on top of the sleeve and lightly press to attach everything. Wait for the glue to dry. Use black colored worsted yarn (or whatever color you prefer) and ch 50, cut off. Tie knots on both ends of the chain. Place down long chain on the top of the top of the crochet piece. Fold the top 2-3 rows of your crochet piece down. You can either sew with the chain underneath or weave the chain through later. Carefully sew down this row leaving enough room for the chain to be able to move within. After the glue has dried fold the crochet piece in half and sew using the long tail. Weave in ends and you are finished! 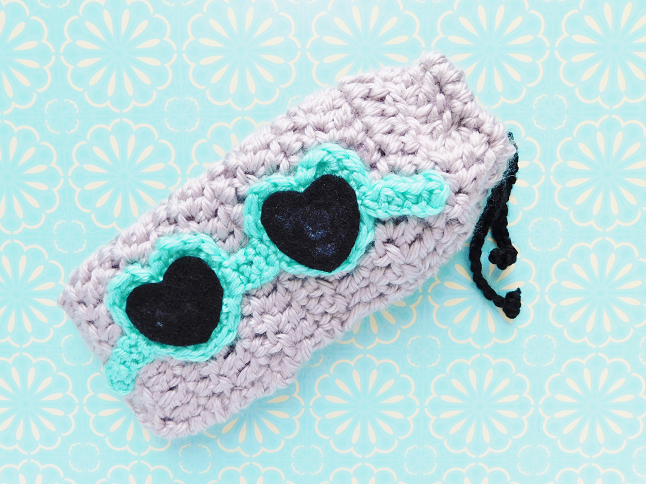 You now have an adorable crochet pouch that you can keep in your bag all year long! This is such a cute diy idea!